My Jewish elementary school so bombarded me with stories of the Holocaust that it looked to me—by the time I’d reached the fifth or sixth grade—as though it were all a plot to drive me towards utter indifference. It was difficult to endure the hurricane of heart-wrench whizzing around my head: Every paragraph beat the concept of helpless victimization into my young skull. Helpless victimization. It didn’t do much for a child’s sense of cultural self-worth. The popular version of Holocaust history regards the Jewish persecution as a racial one, with no substantial distinction between Jews and all the other people the Nazis hated and murdered. No substantial distinction, except perhaps in number and thoroughness. As the especial target of Germany’s motiveless malignity, the Jew appears in retrospect to be nothing but the unluckiest, the most hapless, and in a sense the most pitiable and pathetic creature of the 20th century. It is a disgraceful view which leaves young children with the taste of vomit at the back of their mouths. But it is championed both by Holocaust apologist-minimizers, as well as a large numbers of Jews—typically, those Jews for whom God is a toxic concept best forgotten completely. Of course the Jews are a race: a great international race, by necessity a cancer in Hitler’s nation-as-a-fighting-unit. But Hitler’s hatred of the Jews was not exactly like his racial hatred of Slavs or Gypsies. It was also a spiritual hatred. And that spiritual, religious aspect is something which my school deliberately ignored. “Conscience,” Hitler said, “is a Jewish invention.” An invention of sick minds—as he called Christianity, for which he also blamed the Jews. A life based on responsibility towards God, the ten commandments, love for one’s fellow man: all this was to Hitler an incomprehensible crime against what men ought to be. The religious aspect of Judaism, how it survived in the camps, and how it could possibly survive in the aftermath, is the subject of Eliezer Berkovits’s small but sublime book. With God in Hell is far, far out of print: it’s hard to find a second-hand copy for much less than a hundred dollars. But it may be the greatest book ever written on the Holocaust. It is certainly one of the greatest books ever written on Judaism: a product of extraordinary depth of feeling, with insight as finely tuned as a snowflake. Instead of the sickening and often condescending waves of pity that emanate from so many books on the subject (goopy fingers seeping out towards the reader from murky existentialist protoplasma), Berkovits impresses us with the courage of belief in Judaism and of the nobility of the Jewish soul. It makes us not simply sorry for those Jews who were murdered—it makes us proud to understand what they represent on this earth. We understand why, as Hitler knew, the survival of even one, single Jew was a mortal threat to Nazism. 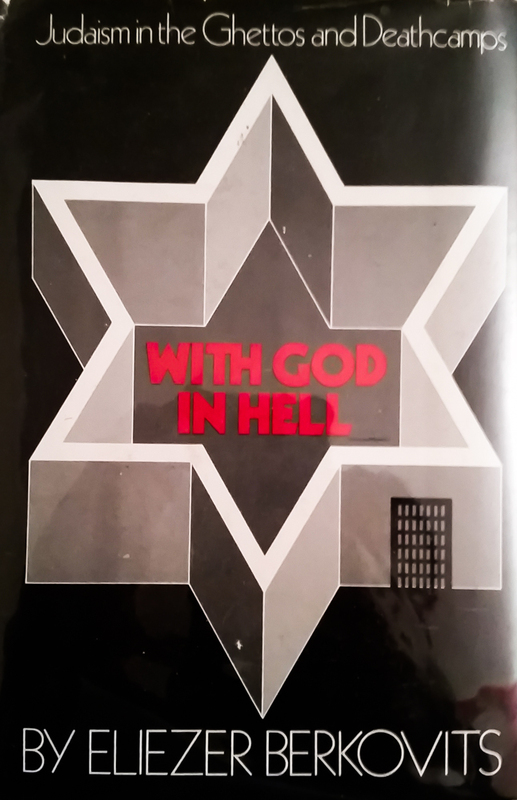 With God in Hell: Judaism in the Ghettos and Deathcamps, by Eliezer Berkovits. Hebrew Publishing Co, 1979. 166 pages. This is a wonderful piece. Why doesn’t Tikvah re-issue this book?